I'm sure you haven't missed my snapshots over the festive season, as the market was quite easy to read. 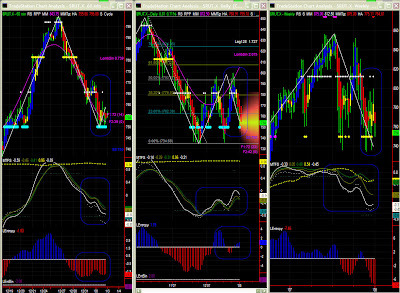 We have seen mostly red bars on the dominant 60mins time frame, until NDX reached Fib PR1. Now what's next? We have closed 2007 on a soft landing on a predictable level. Price erosion is still there and we may have no serious support before 2016, or maybe even 2000. NDX is looking for a lower support. 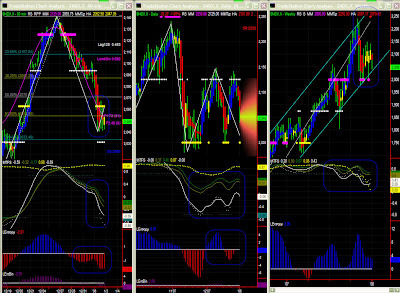 The Swing is momentarily up, which could indicate a pause or a slower fall, but MTFS is still quite bearish. Look for support on 2016 (stall level) or even 2000. Significance level is too low to pay attention to MTFS, and to this time frame in general. Yet, one shall keep an eye on the channel lower boundary currently around 2030. Definite lower bias, but 750 is a strong level which be fought. Caution must be exercised with this late up swing, even if this is a very early indicator. MTFS now points lower yet since lines crossed end November RUT has followed a 'wavy' move upward, and could bounce this time again, within the same difficult, volatile environment. Retracement has about reached its target around 144, so could bounce a bit at this level. However, the bias is certainly down still (MTFS + Entropy). 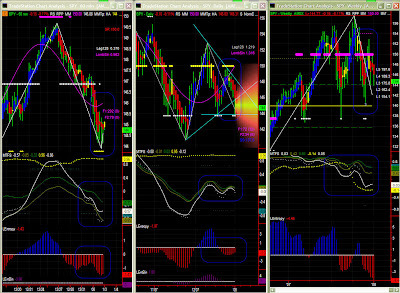 The Swing indicator is usually very early, and maybe too early. One should be cautious and definitely wait for some confirmation of recovery. Despite the low significance level, one must be careful as we have a triangle pattern with a possible breakout coming either way.